In this lesson, we will learn how to convert different types of mechanical energy to and from each other and to recognize when mechanical energy is dissipated. 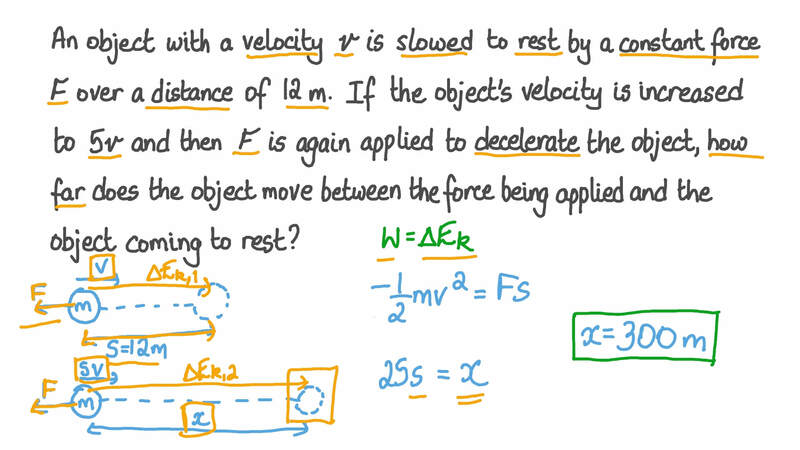 An object with a velocity 𝑣 is slowed to rest by a constant force 𝐹 over a distance of 12 m. If the object’s velocity is increased to 5 𝑣 and then 𝐹 is again applied to decelerate the object, how far does the object move between the force being applied and the object coming to rest? 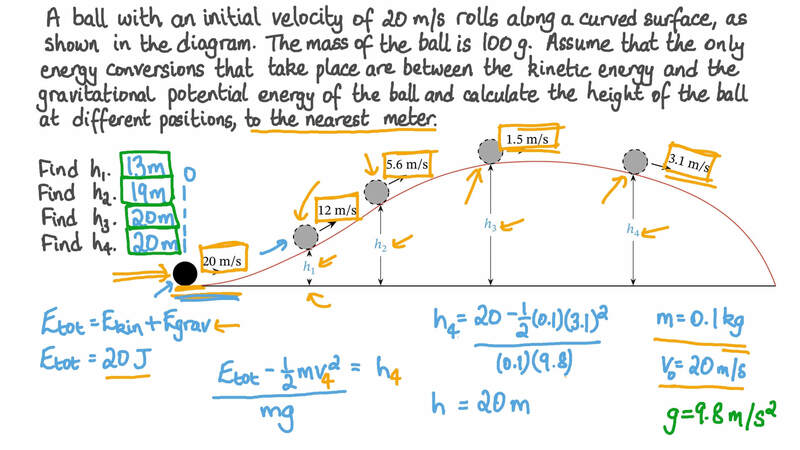 A ball with an initial velocity of 20 m/s rolls along a curved surface, as shown in the diagram. The mass of the ball is 100 g. Assume that the only energy conversions that take place are between the kinetic energy and the gravitational potential energy of the ball and calculate the height of the ball at different positions, to the nearest meter. A ball with an initial velocity of 10 m/s rolls along a curved surface, as shown in the diagram. 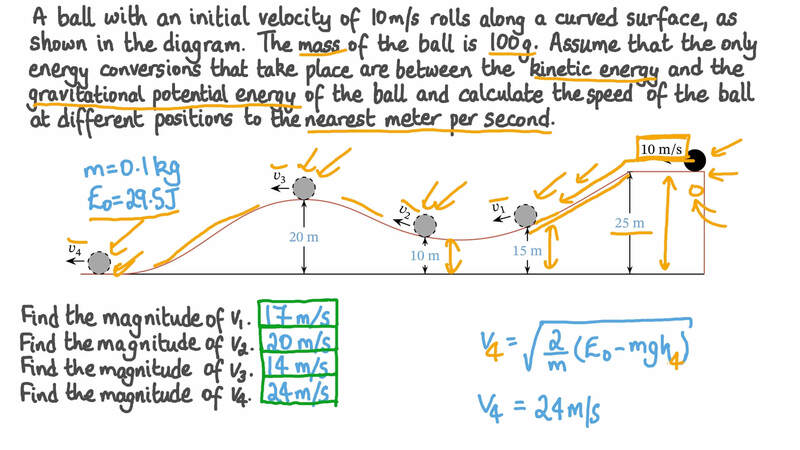 The mass of the ball is 100 g. Assume that the only energy conversions that take place are between the kinetic energy and the gravitational potential energy of the ball and calculate the speed of the ball at different positions to the nearest meter per second. Find the magnitude of 𝑣 1 . Find the magnitude of 𝑣 2 . Find the magnitude of 𝑣 3 . Find the magnitude of 𝑣 4 . A mobile phone with a mass of 120 g is held in the hand of a tourist relaxing on a boat on holiday. The tourist distractedly holds the phone just over the surface of the water and accidentally loses hold of it. The phone sinks through the water, and the instantaneous speed at which it sinks when at a depth of 10 cm is 1.1 m/s. How much work is done moving water out of the phone’s path as it sinks by 10 cm? A child with a mass of 36 kg carries a sled with a mass of 14 kg to the top of an evenly sloping hill, walking 33 m along the hillside and moving vertically upward by 8.8 m. The child puts the sled on the slope where it is just held in place by friction and carefully climbs on board. The added weight of the child is just enough to start the sled moving and it slides down the hill, moving at 10 m/s when it arrives at the base of the slope. How much energy is dissipated during the sled’s downhill motion? What average force of friction does the hillside apply to the sled during the sled’s motion? Answer to the nearest newton.